Omar Torres says he's bowing out of the water district race. Omar Torres has dropped his challenge to Tony Estremera for the District 6 Santa Clara Valley Water District seat, Torres confirmed today to San Jose Inside. The specter of a competitive race between two high-profile Latino officeholders in the normally sleepy water board election held out the prospect of adding some political interest to November’s dull local landscape. District 6 includes the neighborhoods on San Jose’s East Side that were most heavily impacted by 2017’s Coyote Creek flood. 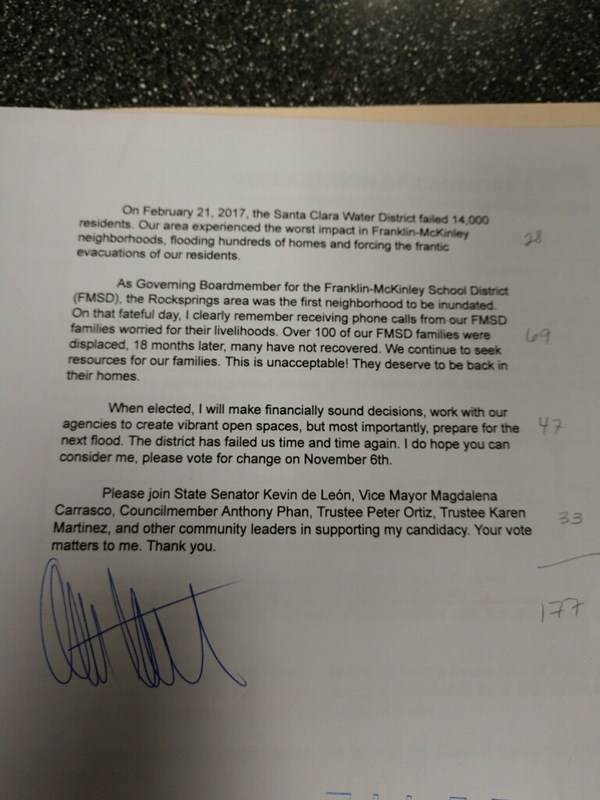 Torres said he was running to advocate on behalf of the flood victims east of downtown and in the Rock Springs neighborhood. In his candidate statement, he criticized the district for failing “time and time again” to prepare for the next flood. “When elected, I will make financially sound decisions, work with our agencies to create vibrant open spaces, but most importantly, prepare for the next flood,” he wrote. The flood, which inundated neighborhoods along Coyote Creek in February of 2017, prompted evacuation orders for 14,000 households, displaced hundreds of families and caused an estimated $100 million in property damage. Nearly 400 victims filed individual lawsuits against the city of San Jose, Santa Clara County and the water district. “This was a decision I made personally,” Torres said, adding that he was not pressured to drop out of the race. Estremera has been on the water board for more than 20 years. He has recently been in the news over the shutdown of the Legal Aid Society of Santa Clara County, a 58-year-old public interest law firm that Estremera has headed since 1997. Torres dropped his bid to be re-elected to the school board to run for the water district seat, so unless he is elected without campaigning, he’ll be out of public office when his term expires in November. But the first-term trustee said he looks forward to completing his term on the board, which lost a trustee earlier this year when John Lindner stepped down as part of a plea deal in a case involving stolen campaign funds. Torres raised money, but was pessimistic about not raising money. Seems a Kevin call to Omar was made. Thank god. Torres is nothing but a loudmouth clown, not a serious public servant. Are you saying there are unseen sinister forces pulling the strings? This doesn’t sound like democracy to me. Why are there considerable amount of posts around complaining about lack of constituent help from Carrasco? I guess we see why. Personally, I like Omar Torres as a person. I think he means well. However; I feel as though the ‘sinister forces pulling the strings’ (whoever they may be) are really going above and beyond in force-feeding him down our throats so as to accept him as a local legitimate community leader, and a serious contender for local public office. Isn’t he supposed to handle district problems? The taxpayers are paying for a council aide, not community leader. Agreed. He is on d5 payroll and needs shouldn’t be working on floods during city time. …AND STOP CAMPAIGNING DURING CITY TIME OMAR. Torres is being paid and cares about only about Torres. He did what as a council aide for flood victims? > Are you saying there are unseen sinister forces pulling the strings? Did the SCVWD do away with term limits?